In contrast to many other gallery builders, JSGalBuilder is not creating HTML files with the gallery (except for an entry page of course). Instead only the scaled images and XML files with the gallery meta data are created. The actual rendering of the gallery is done by JSGal once the gallery is displayed in the browser and is therefore very flexible. Why did I write JSGalBuilder? Most of my JSGal galleries are created using the add2jsgal.pl script and for editing the XMLs I use vim. While this is a perfect solution for me, a lot of friends complained, that they would also like to use JSGal but needed a nice application running under windows to do it :-(. So here is the windows application - of course it's not a windows only app, but rather a java application also running under windows. Actually it's running quiet fine under linux and is even developed there - or why should I write an app for a platform I no longer use ;-). What are the Requirements to run JSGalBuilder? JSGalBuilder requires a Java Runtime version 1.6 or higher. Therefore it should run on any operating system were the necessary java runtime is available. If you experience any problems with a specific OS or java version please let me know. What does JSGalBuilder look like? See screenshot above or directly start JSGalBuilder using the java web start technology. What are the key features of JSGalBuilder? Do you still want to know more about JSGalBuilder? See the online Documentation and the README file. A TAR version containing a normal java jar file and a start shell script for linux and other unix platforms. A ZIP version containing a native windows binary (created with launch4j). A SRC version containing all the necessary sources to build JSGalBuilder yourself. Do you want to try JSGalBuilder yourself? Go ahead and download JSGalBuilder-0.5.tar.bz2 / JSGalBuilder-0.5.zip or start the JSGalBuilder Web Start . What versions of JSGalBuilder are available? What other projects are used by JSGalBuilder? The following projects are used within JSGalBuilder and part of the JSGalBuilder distribution. For more details see the README file or visit the projects homepage. JSGal: A stripped down version of the JSGal distribution is contained within the net.sberk.jsgal.datamodel.dist folder of JSGalBuilder. This files are used for creating a new gallery or updating an existing gallery. 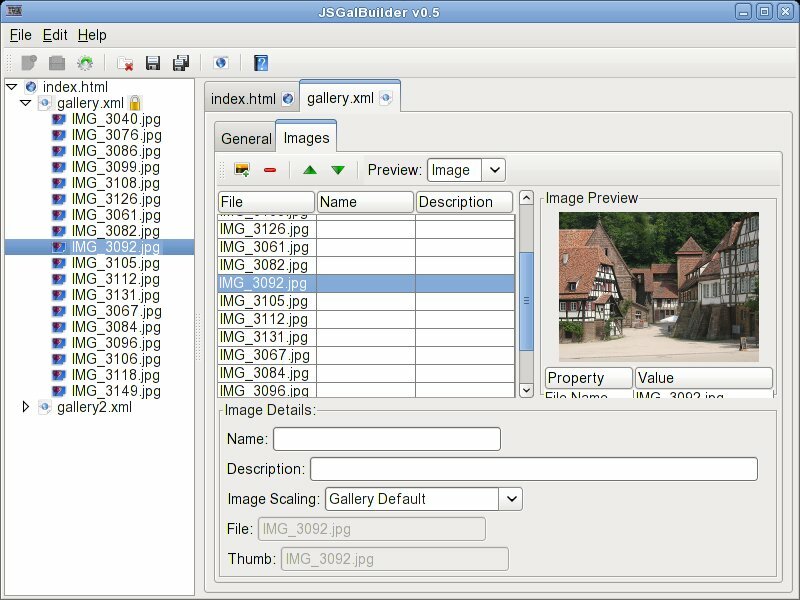 Metadata Extractor: The metadata extractor is used to extract EXIF metadata from JPEG images. It is distributed as part of the JSGalBuilder source code and contained within the com.drew. * packages. Oxygen Icons: The icons used within JSGalBuilder are part of KDE's Oxygen icon theme. The used icons are all taken from the kdebase package and copied into the net.sberk.jsgal.gui.resources folder within the JSGalBuilder source. Do you have any comments, styles sheets, scripts, extensions, ... you want to contribute to JSGalBuilder?